We live in a world in which ecological destruction has run rampant, losing much of the habitat animals need for their survival, while at the same time destroying the ecosystems that billions of people depend upon for their daily bread. In my book the restoration of ecosystem health is the way forward for our communities as we sail into climate change under the dark clouds. This is the latest in the Rainwater Pool Series of videos I have made. All of the other Rainwater Pool Series videos as well as many videos of the wildlife in the rainwater pool are available on the Moshassuckcritters youtube channel. In addition to restoring the habitat at this one pool, the project is a testing ground for some larger issues. The first is to demonstrate that as communities manage stormwater better, we should be aware that there might be places where it is appropriate to use of this newly managed and cleaner stormwater for the restoration of amphibian breeding habitat. Which leads to the need to change the stormwater regulations so that instead of demanding that all stormwater be infiltrated immediately, that there is an acceptance that in appropriate places, places to be determined by laying out a set of criteria and examining the fit, that stormwater can be used to create additional amphibian habitat. I have not laid out the case for the more general rules in this application. But if we can make a convincing case for this site, it becomes a wedge we can use to begin the transforming of the rules. I would like to move much more quickly than I have to change the rules, but am content to do a thorough job demonstrating the ability to restore habitat properly and let the change in the rules follow. My apologies that you are not able to see all of the exhibits and pictures that accompanied the application, but the videos on Moshassuckcritters will provide all of the visuals you will require to understand this application. Friends of the Moshassuck in partnership with the City of Providence Parks Department, proposes to do a small deepening and restoration of the rainwater pool in the City of Providence’s North Burial Ground covered by the maps and photos in this submission. The rainwater pool is approximately 60 feet North –South and 100 feet East –West running from a road runoff chute (Exhibit A) in the northeast towards the southwest. It sits in a small bowl in the southwestern section of the Burial Ground immediately adjacent to the maintenance building. (Exhibits 1 and 2) The site was once near the Moshassuck River, but the site has been extensively manipulated over the years by the building of the Blackstone Canal and Interstate 95, and the original contours of the site are unknown. The river runs underneath the Interstate in this stretch. The site of the rainwater fed pool was for many years a small pond with a fountain, and it is possible the pond was constructed by digging out the bowl. Sometime after World War II, the City of Providence filled the pond so that the site could be used for burials, though no burials were made in the area, and the site still holds water for extended periods of the year. Currently the pool is completely dependent upon rainwater running off 3 roads in the cemetery and the pond levels go up and down pretty consistently with the rains. 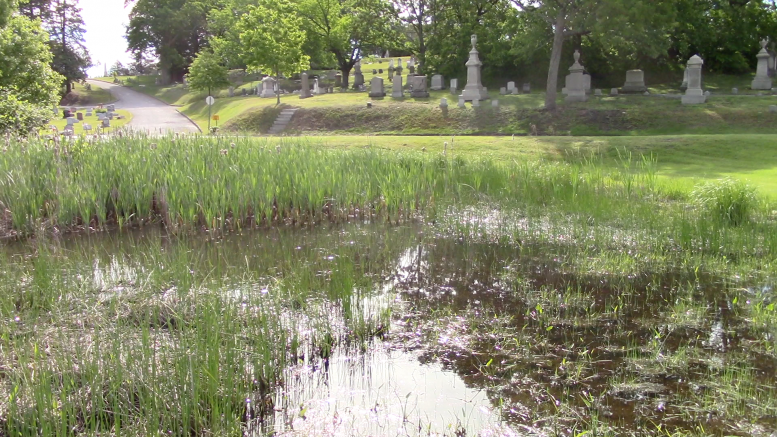 The semi natural wetland was noted in a 1976 report on the burial ground. The report stated that it was used to collect runoff, held amphibian breeding populations, and needed maintenance. Amphibians, with the need for multiple habitats to complete their life cycles, are vulnerable, and even more vulnerable in civilization and during climate change. Amphibian populations and species are disappearing faster than any other large groups of species on the planet right now. The populations using the rainwater pool for breeding are the only Fowler’s Toad and Gray Tree Frog breeders noted in Providence for 100 years. A variety of other amphibian species live in the city, including a bullfrog population at a permanent pond in the Burial Ground, and it is likely that Tree Frogs occur in other parts of the city, but there is no evidence of additional Fowler’s Toad populations in the city, which is why this project is focusing on their needs. Unlike some of the most vulnerable amphibians, Fowler’s Toads breed over a lengthy breeding season whenever conditions are right, and have further resilience in that they can have a breeding cycle interrupted by several dry weeks and start up again when the rains return. Gray Tree Frogs also breed at the pool over an extended season, but tree frog tadpoles are rarely seen, and in only one year in the last 5 have numerous shiny little green frogs come out of the pool. This year there were only 4 male tree frogs calling on the biggest night. The pool needs to hold water longer for tree frogs to metamorphose than the Fowler’s Toads as they mature a bit slower. Long term observations of the Fowler’s Toads use of the pool suggests that they prefer an environment with limited vegetation. While they lay eggs on vegetation at the bottom of pools, the tadpoles are not strong swimmers and need open space for swimming. They do require vegetation for feeding (they eat algae and bacteria off the surface of the plants and other surfaces using a keratin scraper around the mouth) and the tadpoles seem to require shallow water unvegetated habitats for resting and sunning, the sunning appearing to be related to increasing body temperatures to increase the rates of digestion and growth. The tadpoles often reach greatest density in pond edge habitats, and their black color leads to the idea that they are intentionally soaking up sun in the way the turtles in the next pond do. The wetland in question is about 100 ft long east west and about 60 ft north south. Water enters the pool from a chute in the northeast corner where the roads that drain the watershed all empty into the pool. The watershed that feeds rainwater to the pool is very small and is delimited on the largest scale map included in this submission. Water flows down the roads coming from the maintenance building parking lot, with most of the water draining to the north into the cemetery drainage system, but a sliver draining along the southern edge of the road entering the pool, from the southern edge of the road coming down the hill directly East of the pool, again with most of the water coming down the hill draining north towards the cemetery drainage system, and down the road draining the hills to the south and east. This last road is the contributor of the bulk of the water reaching the pool probably on the order of 80 to 90% of the water. All of the roads meet and at that intersection is a small semi engineered chute for the water to flow into the pool. The edge of the pool is 19 feet from the chute, with a flat grassed settling basin and an 8 inch high levee/filter of leaves and other vegetation settling out some of the silt. Silt also settles out amongst the cattails, the bulrush and other vegetation zones. In addition to draining the hillside roads, this road also carries water from the dirt road that provides access to the cemetery sand piles. Where the dirt road meets the tarred road there is a delta, a clear sign of how much silt is coming off the dirt road. Watching the rainwater run down the hill, the water running down the hill is a murky brown, which is an indicator of the sediment load. Hope Leeson of the RI Natural History Survey has provided a preliminary list of vegetation. The survey was done in early May, so some of the plants were hard to identify to species. The southern half of the pool has a more diverse vegetative cover. Soft-stemmed bulrush covers much of the area, extending about 55 feet along the southern edge and 20 feet north into the pool. At its northwestern edge it is about 15 feet from the circular patch that is the greatest extension south of the northern patch. Woolgrass is found among the southern patch of bulrush, with most of it found closer to the shore on “higher” ground, 2 inches or so above the more central spots. There is one rather odd small roundish patch of the spike sedge Eleocharis found in the southeast corner of the pool extending across the mow line. This patch of is only covered by water at the highest water, but both tadpoles and the little toads they become seem to like the area. In many ways the rainwater pool is evolving the way wetlands do, it is filing in and the vegetation is building up the height of the ground, which in the normal course of evolution turns a wetland into dry land. The areas covered by cattails and bulrush are already being elevated by the building up of fallen vegetation and road silt and the build up is leading to the drying out of those areas sooner than previously. They have been elevated about 2 inches in the last few years. One can see this very clearly in the small sliver of water between the main section of cattails and the southern shore bulrush patch. The open water gets narrower each year, and has now been populated by cattails of ever increasing density. The work entails removing approximately 8 inches of silt from the deepest part of the pool, the part of the pool that holds water the longest, to create a “ Harbor of Refuge” and smoothly tapering off until at the current edge of the pool, or where we taper off in places that our work does not reach a shoreline, the depth remains the same as it is now. WE also propose to place a layer of bentonite clay at the bottom of the “harbor of refuge” area to slow infiltration. We shall cut the cattails back about 5 feet and create a small flat bottomed pool of last refuge approximately 20’ by 30’ in the places that now hold water the longest and in the course of removing a few inches of sediment as we slope upwards in the western part of the pond remove some of the pickerel weed, and marginally trim the Soft stemmed bulrush patches as we smooth out the slopes. The cattails, pickerel weed, and other plants should return on their own as none of their patches will be completely removed, though it is recommended that the cattail expansion through the pond be checked by cutting it back every few years or it will obliterate the pool. A map with current vegetation( exhibit 9) distribution is included with the submission as well as views of the proposed work. Pictures of the area from 10 years ago (exhibits 3,4) show a site with no cattails and no pickerelweed, conditions that were more prevalent 6 years ago when I started observing the pool than they are now. No other vertebrates use the rainwater pool regularly, with ducks using it when it is very high and leaving as soon as it shrinks. Killdeer and sandpipers have been seen along the pool very occasionally in early spring, and Canada Geese use it at the highest water levels in the winter. A variety of insects use it as well as microscopic pond fauna. Doing the work in the off season (late August through December) and only when the pool has gone dry will prevent most harm to the fauna as well as flora. Honeybees kept up on the hill in the burial ground use the pickerel weed as a food source, but they too are done by the times of year we suggest is appropriate for this work. The way the work would be done is with a crew of volunteers with shovels, with the silt removed returned to the city sand piles for use in the cemetery. We are not removing much soil, working approximately an area of 40 by 50 including tapering off areas and no more than 8 inches deep in the deep water refuge site in what is currently the deep part of the pool, and much less most places as it slopes to the current wetland edge. About two inches of the top layer of pond bottom should be removed and kept separately. When done this should be returned to the pond to seed flora and fauna. This does mean that in the deep parts of the pool we shall dig down 12 instead of 8 inches so that we can add 2 inches of clay to the bottom before adding the 2 inches back. The clay layer is put on top of the bottom of the pond after excavation, rolled into the sediments, wetted, then covered with soil. It has also been suggested that some sort of silt filter be installed where the rainwater funnels into the pool basin in the northeast corner. That is a project for another year, and the current levee of leaves and brush do a pretty good job except at the highest levels of rainfall. When I spoke to the Restoration Team in February 2017 I made a tentative suggestion that a liner in the proposed deep hole would keep water in the system a bit longer. This was squashed for a variety of reasons, but as much as anything it was squashed because of a lack of understanding of the ecosystem under discussion by DEM personnel. It is quite obvious to me that water is infiltrating into the ground, and as the water/water table goes down, the pond drains. Evidence for this includes the fact that the pond drains at practically the same rate all year round. The contrasting conditions of water draining under the frozen surface in the same number of days as the pond drains in the hot July sun causes me to conclude that infiltration, not evaporation, is why the pond goes dry on the schedule it does. If that is true, that infiltration is critical, deepening the pool will enable the pool to hold water a few days longer, with the lowering of the water table needing to lower 8 more inches if the pool is to go dry. But it also continues to at least suggest that some sort of liner would help the pool to hold water even longer. It is proposed that the “liner” be in the form of a layer of Bentonite clay lain down at the bottom, and then covered by the two inches of upper sediments as has been discussed above. The project is worth doing with or without a lining, But if DEM is going to continue to suggest no liner, I would like to see further explanation of why it is believed that evaporation rather than infiltration is the dominant mode of water lowering in the system at the consistent rates seen in all weathers including frozen.